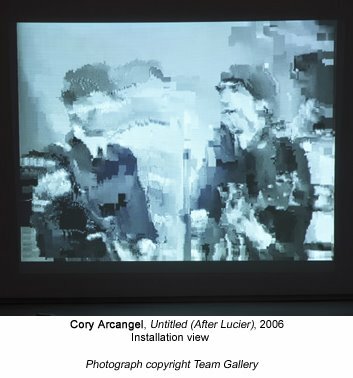 Below is Paddy Johnson's review of Cory Arcangel's "...participatory culture" show at Team Gallery last year. While critical, it is ultimately respectful and merely expresses what many thought about the show but were too cautious to say for fear of jinxing the first non-sucky computer artist to break through to art world recognition. Including me, even though I felt the show was a step back to the "BitStreams" era. I'm bringing it up now because recent writing about the artist seems to be adopting a strangely defensive or belligerent tone--it's as if you have declare whether you're for or against him, and I think we need to get over this. This review was not reBlogged by Eyebeam or Rhizome, the main new media sites, which also seems like a partisan and slightly juvenile snub. The issues are worth discussing. I have been spending a lot of time thinking about how to discuss New Media artist Cory Arcangel’s new exhibition, subtractions, modifications, addenda, and other recent contributions to participatory culture at Team Gallery, and it’s not the exercise in fun it usually is. Writing about my friends is great when I’ve only got compliments to bestow, but it’s another ball of wax when I leave their exhibition with a mental list of artists who have done similar work. Don’t get me wrong, subtractions, modifications, addenda, and other recent contributions to participatory culture, isn’t entirely derivative, nor is it a bad show per say, but it does inspire a number of questions, that aren’t easily resolved. Probably the strongest work in the show is Untitled Translation Exercise, a modified version of Dazed and Confused, a film by Richard Linklater, which now features the redubbed voices of Indian actors performing the screenplay in English. The original movie is a coming of age story about a group of American high schools students experiencing the anxiety, boredom, and fervor of teenage years, so Arcangel’s choice to outsource the dialogue, both heightens the viewer’s sense of what it means to be American, and reflects the development of new industries in the United States. You’d think these ideas would be enough to stamp the piece as good and be done with it, but I can’t reconcile the feeling that the decision to outsource the film’s dialogue isn’t entirely resolved. There are simply too many loose ends at play here. What does the work gain by outsourcing labor that has already been completed? Was it necessary to make a feature length movie? Does the film’s narrative support the alteration? These questions don’t come up in Woody Allen’s similarly conceived, What’s Up Tiger Lily, a 1966 film whereby the director purchased a Japanese spy movie, removed the sound track and replaced it with his own. Clearly the two films are different, but you can’t say the approach doesn’t, at the very least, merit comparison. The other video based works in the exhibition do not invite specific film references the way Untitled Translation Exercise does, but they do seem awfully close to work that has already been made. 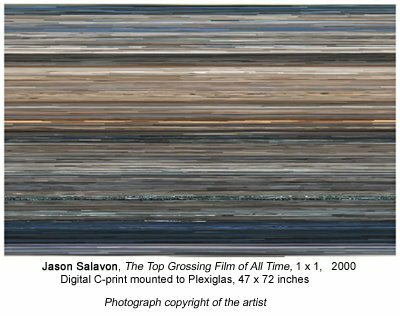 Arcangel’s Colors for example, extends pixels line by line in the Dennis Hopper movie by the same name to create a moving vertical pattern reminiscent of New Media artist Jason Salavon’s The Top Grossing Film of All Time 1×1. 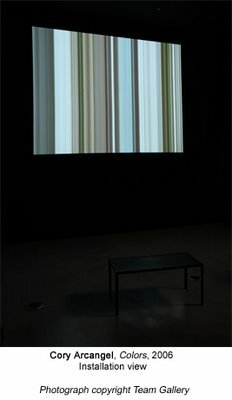 Exhibited in 2001 at the Whitney’s exhibition Bitstreams, the artist uses the average color of each frame in the movie Titanic, and arranges them in a digital c-print to follow the narrative sequence they would have appeared in. I suspect the programs each artist wrote to create their work were difficult to execute, but unlike the work of Salavon, those with even a small amount of website construction experience will be familiar with the technique of expanding pixels, and subsequently won’t find the Arcangel manipulation all that interesting. Even without this knowledge, I imagine many viewers will still be left wondering what the point of the alteration is (other than to create a moderately attractive picture). The reason these issues exist in this work, as with Untitled (After Lucier), a video loop of the Beatles on The Ed Sullivan show which compresses and loses image quality with each repetition, is that in each case, the content is subservient to the technology. And unfortunately, just as painting about painting is dull, so is tech art about tech. The thing is, Arcangel knows this, so despite the fact that some of the work in this show falls short, I have trouble believing that the exhibition is some sort of sign of things to come. Two weeks ago at Vertexlist, the artist performed pieces from his record The Bruce Springsteen ‘Born To Run’ Glockenspiel Addendum (also part of his show), and while, I can’t claim to understand why the record needed to be a remix album (the artist composed five Glockenspiel pieces for the Bruce Springsteen album Born to Run, in addition to the three Springsteen had already written, matched them to the time count of the music, and removed the original music), his performance demonstrated his usual brilliance. There was a charming awkwardness to his playing, which made the piece at once humble, moving, and strangely funny. In fact, it was so enjoyable, that the thought occurred to me that while subtractions, modifications, addenda, and other recent contributions to participatory culture, isn’t the best thing the artist has ever done, if he had thrown a performance into his show, nobody would have ever known the difference.